Aborrajados are a Colombian treat, and like buñuelos and torta de choclo they are hard to categorize. They are both savory and sweet - appetizer and/or dessert. 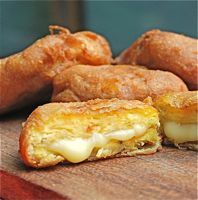 Aborrajados are sweet ripe slices of plantain that have been stuffed with cheese, coated in batter and deep fried. Some people like to add a slice of guava paste to their aborrajados, which pushes them towards the dessert category. Heat several inches of oil to 360 degrees. Slice the ends off of the plantains, then slice through the peel lengthwise several times to help remove the peel. Slice the plantains crosswise into 1 1/2 inch thick pieces. Fry the plantain slices in the oil until golden brown, about 4 minutes. Drain the plantain pieces on paper towels. When cool enough to handle, place each slice between two pieces of wax paper, and use the flat bottom of a glass to flatten the plantain to about 1/4 inch thickness. Sandwich 1-2 tablespoons of grated cheese between 2 slices of plantain, pressing the plantain together around the edges to seal in the cheese. Repeat with remaining plantain slices. Whisk the flour, sugar, baking soda and salt together. Stir in the eggs, and add enough milk to make a thick batter. Stir until well mixed. Dip the plantain "sandwiches" into the batter to coat them, then return them to the oil to fry in batches, until golden brown and crispy on the outside (about 4 minutes). Drain on paper towels and serve warm.